This may appear to be an awkward time to present a model-data comparison. This post will appear between two excellent post at WattsUpWithThat, both of which discuss the flaws in the IPCC’s use of the multi-model ensemble mean. One post (here) is by Geoffrey H Sherrington and the other (here, a sticky post) is by Robert G. Brown of Duke University—a.k.a. blogger rgbatduke. They are worth reading. Regardless of the discussions taking place around the blogosphere, the IPCC and climate science community as a whole will continue to present hindcasts and projections using multi-model ensemble means. And my posts have shown and will continue to show that the climate models, using those model means, show no skill at hindcasting. If they show no skill at hindcasting, there’s no reason to believe their projections of future climate. The temperature difference between daily maximum and minimum temperatures is known as the diurnal temperature range. The much-reported decrease in the diurnal temperature range has been said to be one of the “fingerprints” of human-induced global warming. Climate models, of course, were used for attribution studies to determine that manmade greenhouse gases were one of the causes. 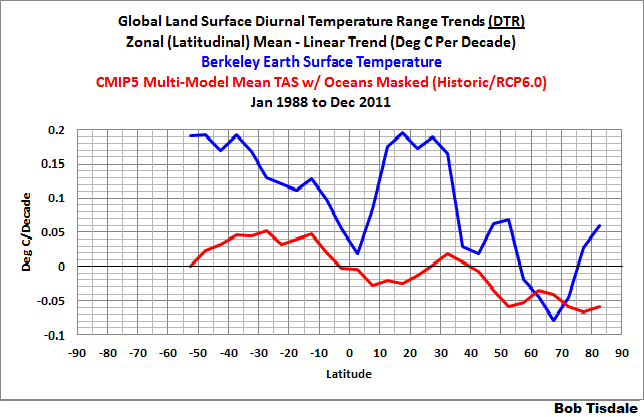 Then along came the Berkeley Earth Surface Temperature (BEST) data, which showed an increase in the diurnal temperature range since 1988. Oops! 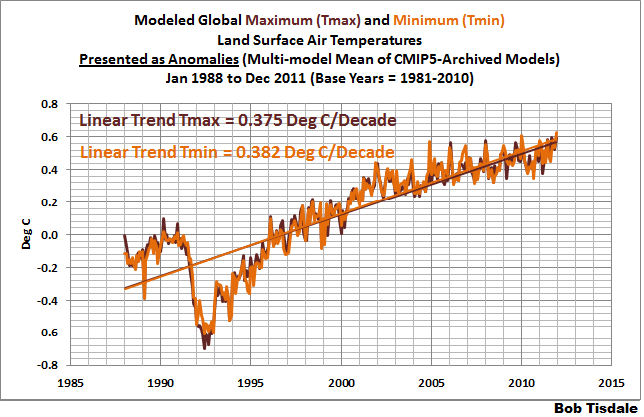 This post is a model-data comparison of maximum (Tmax) and minimum (Tmin) temperature anomalies as presented by the BEST data and the multi-model ensemble mean of the climate models stored in the CMIP5 archive. 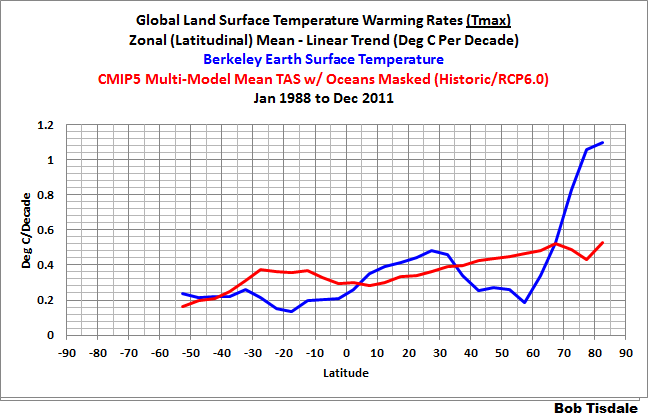 Those climate models were prepared for the IPCC’s 5th Assessment Report. As one might suspect, the models did not perform well, and that’s putting it nicely. If the decrease in diurnal temperature range is a “fingerprint” of human-induced global warming, climate scientists need a better AFIS. Analysis of the global mean surface air temperature has shown that its increase is due, at least in part, to differential changes in daily maximum and minimum temperatures, resulting in a narrowing of the diurnal temperature range (DTR). Analyses of the year-month mean maximum and minimum surface thermometric record have now been updated and expanded to cover three large countries in the Northern Hemisphere (the contiguous United States, the Soviet Union, and the People’s Republic of China). They indicate that most of the warming which has occurred in these regions over the past four decades can be attributed to an increase of mean minimum (mostly nighttime) temperatures. Mean maximum (mostly daytime) temperatures display little or no warming. In the USA and the USSR (no access to data in China) similar characteristics are also reflected in the changes of extreme seasonal temperatures, e.g., increase of extreme minimum temperatures and little or no change in extreme maximum temperatures. The continuation of increasing minimum temperatures and little overall change of the maximum leads to a decrease of the mean (and extreme) temperature range, an important measure of climate variability. The cause(s) of the asymmetric diurnal changes are uncertain, but there is some evidence to suggest that changes in cloud cover plays a direct role (where increases in cloudiness result in reduced maximum and higher minimum temperatures). Regardless of the exact cause(s), these results imply that either: (1) climate model projections considering the expected change in the diurnal temperature range with increased levels of the greenhouse gases are underestimating (overestimating) the rise of the daily minimum (maximum) relative to the maximum (minimum), or (2) the observed warming in a considerable portion of the Northern Hemisphere landmass is significantly affected by factors unrelated to an enhanced anthropogenically-induced greenhouse effect. The usefulness of global-average diurnal temperature range (DTR) as an index of climate change and variability is evaluated using observations and climate model simulations representing unforced climate variability and anthropogenic climate change. On decadal timescales, modelled and observed intrinsic variability of DTR compare well and are independent of variations in global mean temperature. Observed reductions in DTR over the last century are large and unlikely to be due to natural variability alone. We use a global climate model to investigate the impact of a wide range of radiative forcing and feedback mechanisms on the diurnal cycle of surface air temperature. This allows us not only to rule out many potential explanations for observed diurnal changes, but to infer fundamental information concerning the nature and location of the principal global climate forcings of this century. We conclude that the observed changes of the diurnal cycle result neither from natural climate variability nor a globally-distributed forcing, but rather they require the combination of a (negative) radiative forcing located primarily over continental regions together with the known globally-distributed forcing due to anthropogenic greenhouse gases. The twentieth-century warming has been accompanied by a decrease in those areas of the world affected by exceptionally cool temperatures and to a lesser extent by increases in areas affected by exceptionally warm temperatures. In recent decades there have been much greater increases in night minimum temperatures than in day maximum temperatures, so that over 1950–1993 the diurnal temperature range has decreased by 0.088C per decade. 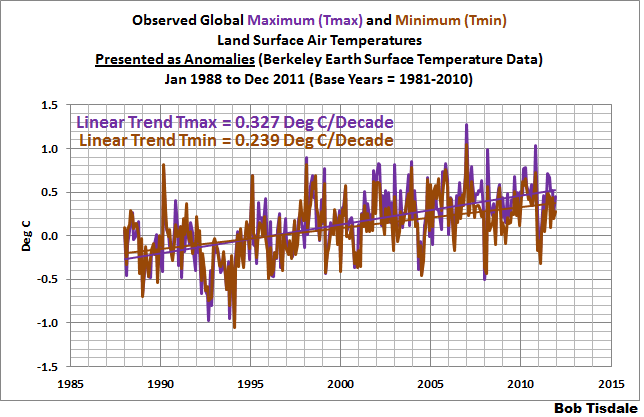 But as shown in Figure 1 above, it’s obvious in the Berkeley Earth Surface Temperature (BEST) Daily Maximum (Tmax) and Minimum (Tmin) Temperature data that the diurnal temperature range has been increasing over the past 2+ decades, not decreasing. Some of the climate models predict that the diurnal temperature range, that is, the difference between Tmax and Tmin, should decrease due to greenhouse warming. The physics is that greenhouse gases have more impact at night when they absorb infrared and reduce the cooling, and that this effect is larger than the additional daytime warming. This predicted change is sometimes cited as one of the “fingerprints” that separates greenhouse warming from other effects such as solar variability. Previous studies [15-18] reported significant decreases in the diurnal temperature range over the period 1948 to 1994. Jones et al. for example described the decrease as 0.08°C per decade for the period 1950 to 1993. 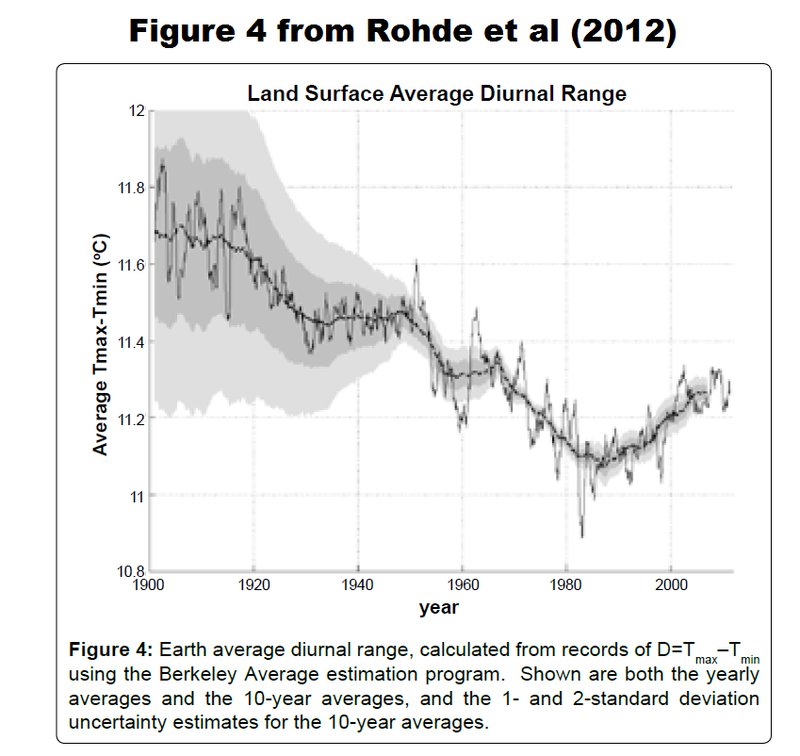 Rohde et al (2012) presented the Diurnal Temperature Range in their Figure 4, which I’ve included here as my Figure 2. The result of this calculation is shown in figure 4. The solid line represents the annual average of the diurnal range, and the dashed line shows the 10-year running average. The 1- and 2-standard deviation error uncertainties are shown with the two grey bands for the 10-year average. The behavior of the diurnal range is not simple; it drops from 1900 to 1987, and then it rises. The rise takes place during a period when, according to the IPCC report, the anthropogenic effect of global warming is evident above the background variations from natural causes. Although the post-1987 rise is not sufficient to undo the drop that took place from 1901 to 1987, the trend of 0.86 ± 0.13°C/century is distinctly upwards with a very high level of confidence. This reversal is particularly odd since it occurs during a period when the rise in Tavg was strong and showed no apparent changes in behavior. Hmm. Rohde et al seem to be throwing a few jabs at the IPCC and the previous papers. Let’s see if those jabs are deserved. 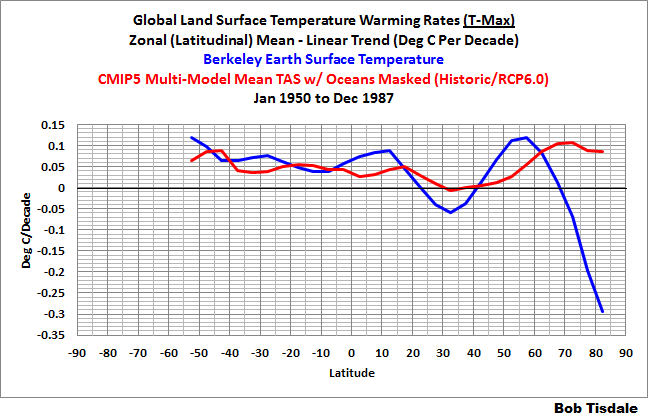 As noted in the overview, this post compares the Berkeley Land Surface Air Temperature (BEST) data to the multi-model ensemble mean of the climate models prepared for the upcoming 5th Assessment Report of the Intergovernmental Panel on Climate Change. We’ll compare the daily maximum and minimum temperature data and the differences between the two. The source of the data and model outputs is the KNMI Climate Explorer. There, the BEST daily minimum and maximum data are presented only as anomalies, not in absolute form. As a result, I cannot present the modeled and observed diurnal temperature ranges in time-series graphs. That’s fine. We’ll present the differences in the trends of modeled and observed daily maximums and minimums. We’ll break the comparisons into two parts, based on the dividing year identified by Rohde et al (2012). The first group of comparisons will be for the period of 1988 to 2011, which is the period when Rohde et al found an increase in the diurnal temperature range. For the second group, ending in 1987, we’ll use the start year of 1950 for two reasons. First, based on the Rohde et al Figure 4 (my Figure 2), the data uncertainties grow quite large before 1950. Second, I wanted the mid-20th Century cooling period to be a significant portion of the time period. 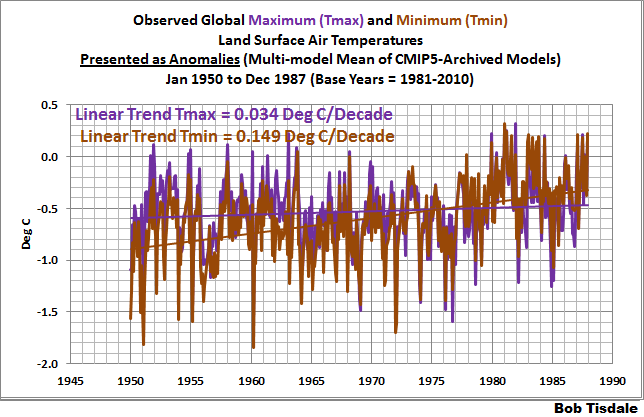 I’ve used the WMO-recommended base years of 1981-2010 for anomalies in the time-series graphs. Because the IPCC is moving into regional climate projections in AR5, we’ll also compare the modeled and data linear trends on zonal-mean (latitude average) bases. With these trend comparisons, the fact that data is presented as anomalies becomes a moot point, and as a result, we can present the trends in the diurnal temperature ranges. 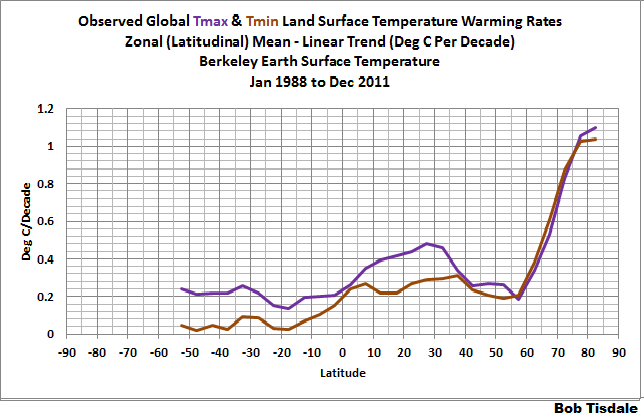 Figure 3 is a time-series graph of the BEST maximum and minimum temperature anomalies for the period of January 1988 to December 2011. This confirms the discussion from Rohde et al (2012). The maximum temperatures are warming a faster rate than the minimums. Based on the differences in the linear trends, the diurnal temperature range increased at a rate of about 0.09 Deg C/decade from 1988 to 2011. On the other hand, the multi-model mean of the CMIP5-archived models the minimums and maximums are warming at basically the same rates from 1988 to 2011, with minimums warming at a slightly higher rate. See Figure 4. According to the models, if anthropogenic greenhouse gases and aerosols were the cause of the trends in the diurnal temperature range, there should have been minor decrease, not a significant increase, during this period. 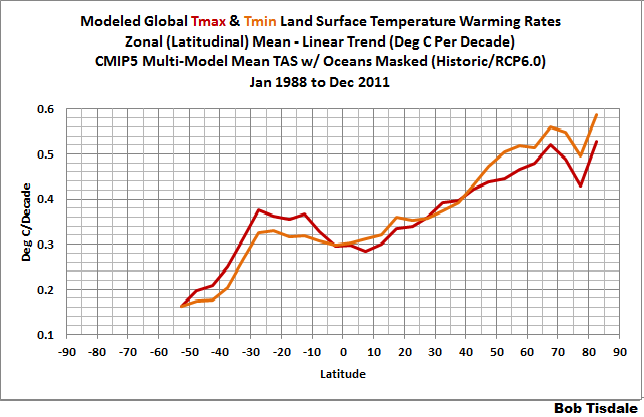 The graphs in this section present the warming rates based on linear trends for the period of January 1988 to December 2011. The (vertical) y-axis is scaled in deg C/Decade. The (horizontal) x-axis is scaled in degrees latitude. “-90” or 90S to the left is the South Pole, “0” is the equator, and “90” or 90N is the North Pole. Looking at Figure 5, the model-mean output of 0.25 deg C/decade at zero latitude indicates the models simulated that the maximum temperatures at the equator should have warmed at a rate of 0.25 deg C per decade from 1988 to 2011. To create the graph, the data and model outputs are first downloaded in 5-degree latitude bands. For example, the data point at -52.5 deg latitude includes the data from 55S-50S, and the data point at -47.5 deg latitude is for the data from 50S-45S. Then the linear trends (the warming rates) in deg C/decade are determined by the spreadsheet software. Now let’s compare the models to the observations in Figure 5. The models overestimate the rate of warming in maximum temperatures from about 45S to 5N and from 35N to the Arctic. The models underestimate the rate of warming slightly from 5N to 35N, but grossly underestimate the polar-amplified warming in the Arctic. Hmm. We’re often told that polar amplification is consistent with climate model projections, while, in reality, the multi-model mean shows little polar amplification by comparison to the data. The failure of the models to simulate the polar amplified warming should come as no surprise to regular visitors. We showed in the post here last year that the models do not show the polar-amplified warming in the Arctic during the recent warming period, or the polar-amplified cooling in the Arctic during the cooling period from the early-1940s to the late-1970s. 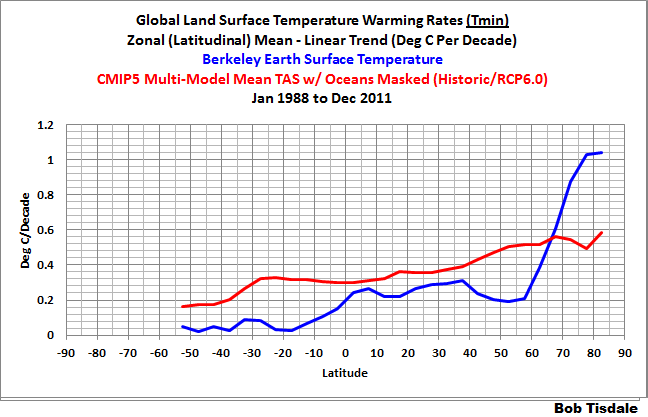 Figure 6 illustrates the modeled and observed warming rates in minimum temperatures from 1988 to 2011. The models overestimate the warming rates in minimum temperatures from South America to the Arctic, but again fail to capture the polar-amplified warming in the Arctic. Note also that the observed minimum temperatures show little warming in the extratropics of the Southern Hemisphere. The observed warming rates of the minimums increase gradually until just north of the equator and then remain relatively constant until about 57N, where the polar amplification kicks in. I’m providing Figures 7 and 8 as references for Figure 9. Figure 7 includes the observed warming rates in maximum and minimum temperatures from 1988 to 2011, and Figure 8 compares the modeled maximum and minimum warming rates. 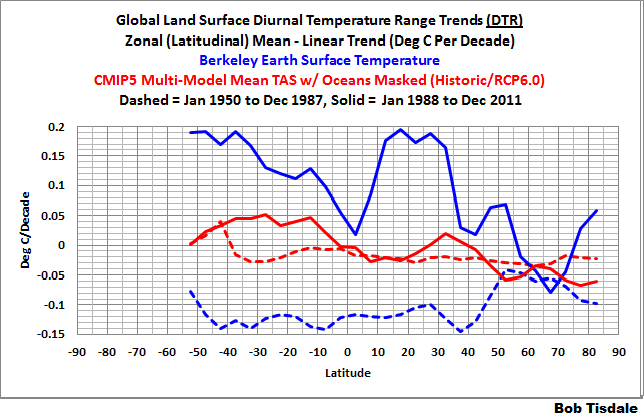 Figure 9 presents the observed and models trends in the diurnal temperature ranges on zonal-mean bases. They were calculated as the differences between the observed and modeled trends in the maximum and minimum temperatures. Based on Figures 3 and 4, we already knew that the models failed to simulate the observed rates of warming as shown in those time-series graphs. So the intent here is really to show that the trends in the observed diurnal temperature ranges are not the same around the globe. Keep in mind that a positive trend in the diurnal temperature range indicates the maximum temperatures are warming faster than the minimums—and vice versa for a negative trend in the diurnal temperature range. 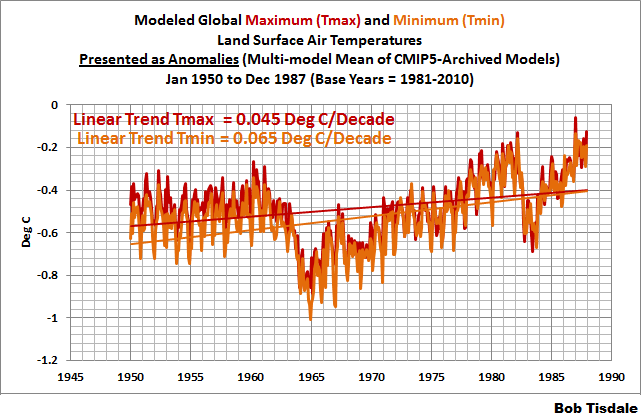 Figures 10 and 11 present the observed and modeled maximum and minimum temperatures (as anomalies) for the period of 1950 to 1987. Both the models and observations show minimums warming faster than the observations. But the models are showing that, if anthropogenic factors were responsible for the additional warming of the minimum temperatures, then the rate of warming should have been much less than the rates observed. That is, the models are showing a decrease in the diurnal temperature range that’s less than one fifth of the observed rate. 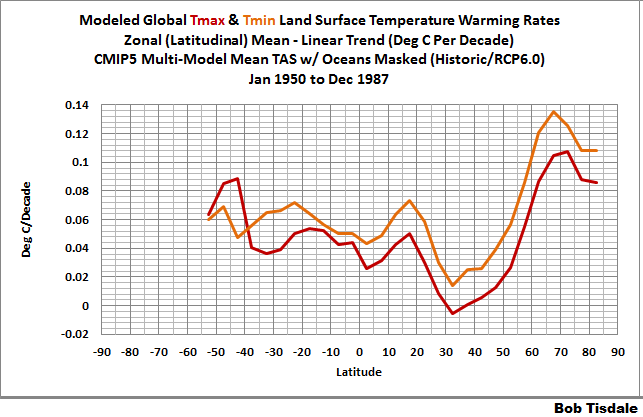 Figure 12 presents the trends in the maximum temperatures from 1950 to 1987 on a latitudinal basis. The models perform reasonable well until the extreme high latitudes of the Northern Hemisphere, where temperatures cooled over this period. 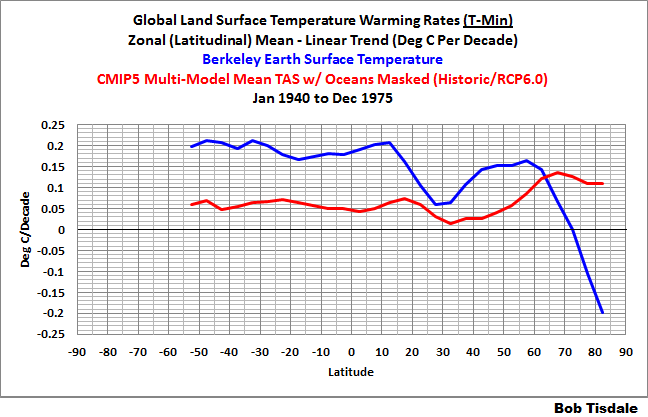 For the trends in the minimum temperatures from 1950 to 1987, Figure 13, the modeled warming rates were consistently higher than the observed trends—until they reach the Arctic, where, again, minimum temperatures cooled while the models say they should have warmed. Figures 14 and 15 serve as references for Figure 16. 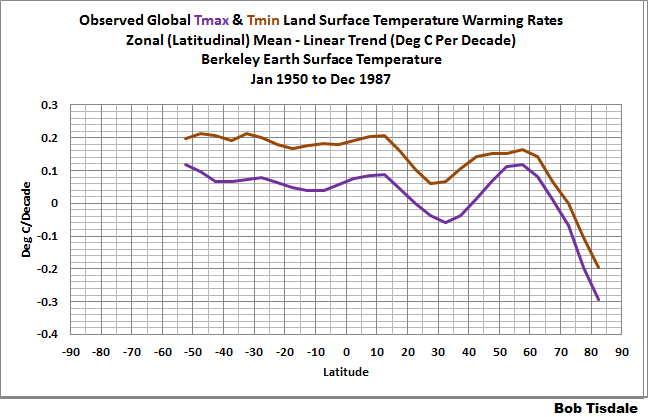 Figure 14 includes the observed warming rates in maximum and minimum temperatures from 1950 to 1987, and Figure 15 compares the modeled maximum and minimum warming rates. 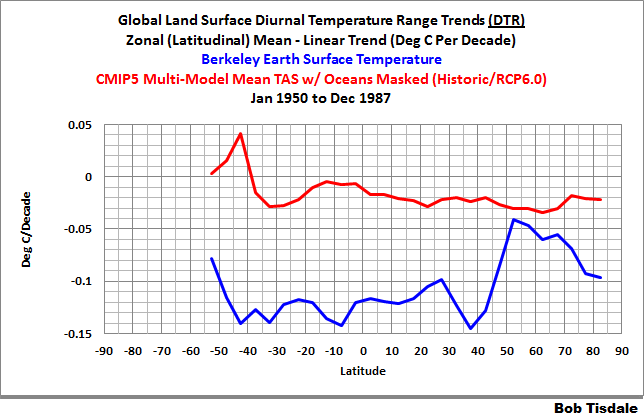 Figure 16 shows the difference between the modeled and observed trends in diurnal temperature range for the period of 1950 to 1987. There is only a small region at the mid-latitudes of the Northern Hemisphere where the modeled trends in diurnal temperature range come close the observations. One last graph: Figure 17 is for those readers who want to compare the modeled and observed trends in diurnal temperature ranges for the periods of 1950 to 1987 and 1988 to 2011. That’s a very poor showing over both time periods, especially when one considers that the IPCC is moving toward regional modeling over decadal and multidecadal periods. Why are they even bothering, other than to throw away billions in taxpayer dollars? Climate science is still in its infancy. And so far there has been little to no return on the investment. No ifs, ands or buts about that. I have a funny feeling I’ll be publishing another book. It will be relatively short, easy to understand and contain lots of graphs. I suspect the release date will be around the time that newspapers are heralding the gathering of politicians who’ve assembled to finalize the content of the Summary for Policymakers of the IPCC’s 5th Assessment Report. This time, I’ll release the book right from the get go in Amazon Kindle form, under their KDP select program. That way it’s free initially. Maybe you can help with the title. My thoughts are to start with If You Can Read a Graph… But the best remainder I can come up with is …Why Do You Believe the IPCC? The subtitle: The IPCC’s Climate Models Show No Skill Simulating the Past. Why Do You Believe Their Projections of the Future? Hi Bob – An excellent post as usual! 1976-78: Tmin makes a markedly greater leap up than Tmax. Late 80s: Tmax jumps back up on level with Tmin. Late 90s: Tmax jumps past Tmin. Where have we seen these particular shifts before? Kristian: To me it appeared that the 1976 climate shift had a bigger influence on Tmin than Tmax. 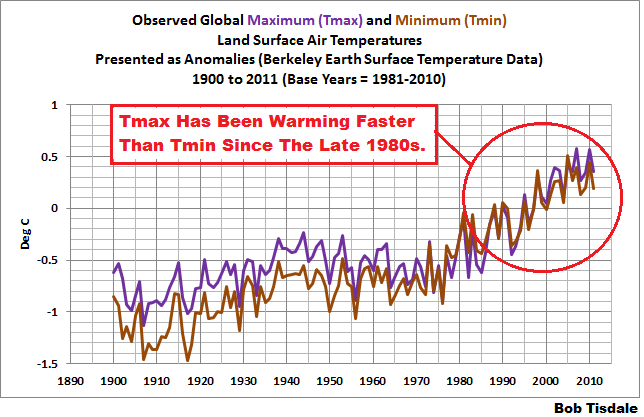 Tmin started warming from then, but Tmax waited a few more years before it took off, warming faster than Tmin. Roger, as always, thanks for your kind words and suggestions. I would imagine that every now and then you get the idea for a post. Feel free to email me. I’ll post it here and at WUWT. Here is an example of what happens to you if you challenge the establishment. Kelvin Vaughan: That’ll teach Ignaz Semmelweis for trying to wash his hands of the whole mess.